My experience in Open source technologies and Microsoft world has been a very learned one. I was blessed enough to get challenges and find resolutions to them. This website is an effort to share experiences from this journey. I will share my experiences in form of code samples in Microsoft and Open source technologies stack, Analysis & Design documentation and tips/tricks of the trade. The below-given image is an example output of a brainstorming session on Software Licensing model. This session was focused on getting attributes that strikes your brain when you think about software licensing. What things can be done to have a better software licensing in place is a wider topic but this is just an attempt to start in that direction. It has the focus on attributes that includes software licensing implementation including hardware and/or software. The brainstorming tool used in this session was XMIND . 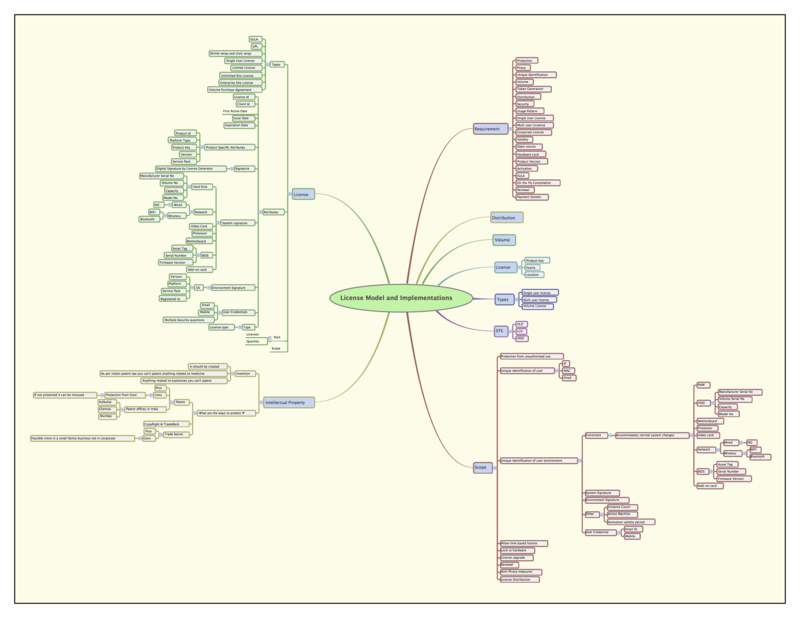 The software licensing model image below is a screenshot of XMIND mind mapping document. Copyright © 2018, Bhawesh Kumar.